WANT TO BE PART OF A MIRACLE? 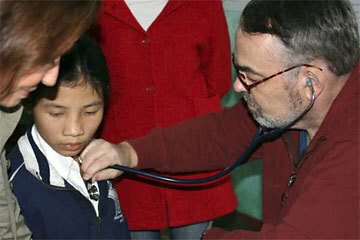 Since 1989, Vets With A Mission has implemented numerous humanitarian programs and projects in Vietnam. But one of its most important is the Children’s Heart Surgery Program. The CHSP provides major cardiology procedures—often life-saving operations— for children, teenagers or adolescents who otherwise would not receive them. Heart operations are done for “pennies on the dollar” when compared to the cost in the United States, Canada or outside of Vietnam! February is Heart Surgery Sponsorship Month! As an IRS approved 501(C) (3) charitable non-profit organization, your donation as a sponsor is fully tax deductible. VWAM’s in-country administrator assures accountability of both the patient and your gift. HOW IS YOUR HEART SURGERY DONATION HANDLED? When you make a gift to Vets With A Mission to sponsor a child’s heart procedure, your tax-deductible donation is deposited in the Medicine-Equipment-Surgery Fund, a designated account. 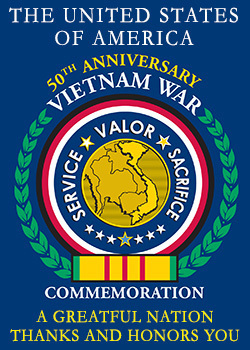 Prior to a medical mission departing for Vietnam, funds are transferred from Wells Fargo to HSBC bank in Vietnam, a secure private financial institution. VWAM uses the HSBC branch in Da Nang. VWAM’s Executive Director approves all transfers for payment of any operation, once documentation is received, verifying a physician’s diagnosis and hospital expenditures. Prior to transfer of funds or payment to the hospital, VWAM’s in-country representative, Mr. Tran Xuan Nam in Hue, checks all charges for accuracy before the authorized funds are transferred or payment made. An expense report is sent to Vets With A Mission for accountability and record-keeping. 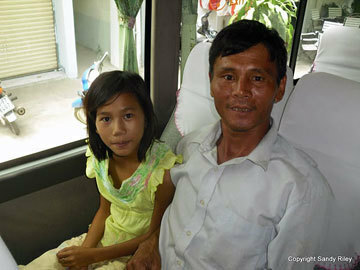 Heart Patient 13 yr old Phan Thi Ngoc Anh with Father from Da Nang. HOW IS SURGERY DONE AND WHY? Years ago the only choice was to bring patients to the US, Canada or another country. This is no longer necessary due to medical advances in training and facilities. Heart surgeries take place at Hue Medical College-Hue Central Hospital by Vietnamese surgeons. Procedures are far less expensive in Vietnam, about a sixth of what it costs in the US or another country. VWAM has sponsored over 54 heart operations to date, but more children still need them. In fact nearly 400 children, teens and young adults are on the heart “Waiting list.” Money is the major issue and that’s why they’re on such a list. Many poor families cannot afford the procedure, and sometimes, their child faces a premature death - unless there is a miracle. DO YOU WANT TO BE PART OF A MIRACLE IN SOMEONE’S LIFE? HOW ARE PATIENTS CHOSEN FOR HEART SURGERY? Vets With A Mission humanitarian medical teams offer free primary healthcare examinations in rural areas. If an operation is recommended, the patient is sent to the hospital for further tests and confirmation of the diagnosis. VWAM pays for these tests, hospitalization and transportation assistance, if needed. 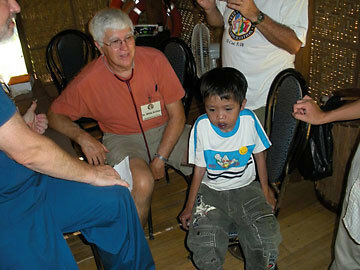 Once financial need is verified, the patient is then notified of the heart surgery sponsorship. Arrangements are made with Hue Medical College-Hue Central Hospital. Vets With A Mission’s in-country liaison participates in the process from the very beginning. He verifies costs, follows treatment, serves the patient and their family. When it’s time to “pay the bill,” often the entire family goes with him to the hospital to show their appreciation. He makes sure they understand the role VWAM and their sponsors played in making this possible. And then another friend informs them of the “ministry reasons” why we do this. If appropriate, in his opinion and the opportunity presents itself, the “Gospel” is shared by this friend with the patient and family. HOW YOU CAN JOIN US AS A HEART SURGERY SPONSOR? Children in Vietnam are just like children in the US. And most of us have grandchildren, so we can empathize with the parents of these kids who desperately need a life-altering or life-saving procedure. Imagine an entire examination, pre-op, surgery, hospitalization and post-op that costs less than $4,000 US! Here it would be ten or twenty times that amount, so the "Bang you get for your buck" investing in the CHSP is remarkable and an incredible ROI. Please join us today in sponsoring an operation in part or to fully fund one.